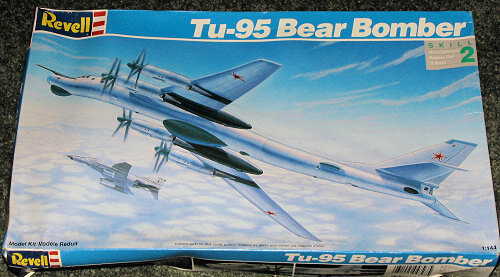 First shown to the West in 1955, the Tu-95 Bear was really the Soviet Union's first true intercontinental bomber. The piston engine aircraft of the time (based on the B-29) did not have the range and the first jet bombers of proper load carrying capability were also stifled by fuel thirsty engines that would not provide the needed low fuel consumption. In some cases, it was doubtful if they'd even be able to perform a one way mission. The answer was a streamlined airframe and more fuel conservative turboprops that were nearly as fast as the pure jet aircraft anyway. It was also developed into a Maritime patrol aircraft and long after standard Bear production had stopped, the lines were opened up again for an upgraded aircraft called the Tu-142. This aircraft was only superficially the same as nearly all the airframe and electronics were upgraded or enlarged. Released in 1992, to my knowledge, that was the only time this kit was released. I can recall seeing one built up shortly after its introduction and I was quite impressed by it. The size is sufficient for most collections without overwhelming it as a 1/72 version or even the horrid VEB 1/100 kit would. Though the recent Trumpeter kit may well be superior, I got this one for less than 1/4 the MSRP of the Chinese kit. The kit is very nicely done with engraved panel lines and none of that rather odd rivet detail that Trumpeter is so enamored with. The engraving around the engines may seem a bit much to some, but will be softened by a coat of paint. Due to the size of the wings, it is in five pieces with a single center section including the outboard engine nacelles. To this is fitted the upper wing halves and later the outer lower wing sections. It seems to work well. The inboard engines with the wheel wells are separate constructs. The fuselage is separated horizontally and one traps the completed wing between them. 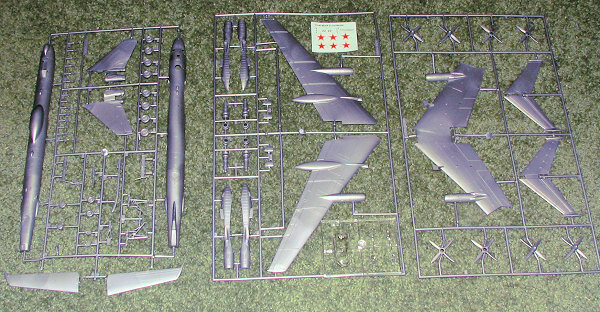 Clear bits are a single piece that fits inside the fuselage. The nose has the framework as part of the upper fuselage half. This is something that begs to be painted prior to fuselage assembly and then simply masked until the rest of the model is done. Of course, there is no cockpit . There is a reasonable tail gunner's position and the landing gear are well formed and sturdy looking. I found almost no molding glitches, only some sink areas on the fuselage opposite alignment pins. Instructions are well done with 21 construction steps, each identifying the part needed and the color (if required). It shows no nose weight info as a tail stand is provided, but I'd put some in and forego the prop. Russian aircraft tend to be boring (bare metal, red stars and nose numbers), and this is no exception, being an overall unpainted aluminum with various black radomes and a black exhaust area on the lower wing. A small and well printed decal sheet is included. If you like the Bear and don't want to fork out $50 for the Trumpeter kit, then I recommend this one. It probably isn't as up to date as the Trumpeter kit, but from what I see, you should be very pleased with the results and the money saved.